Katie Ledecky and Jordan Wilimovsky earned their second wins and Olympic Trials cuts of the 2018 USA Winter Nationals, more swimmers reached the top of the podium. 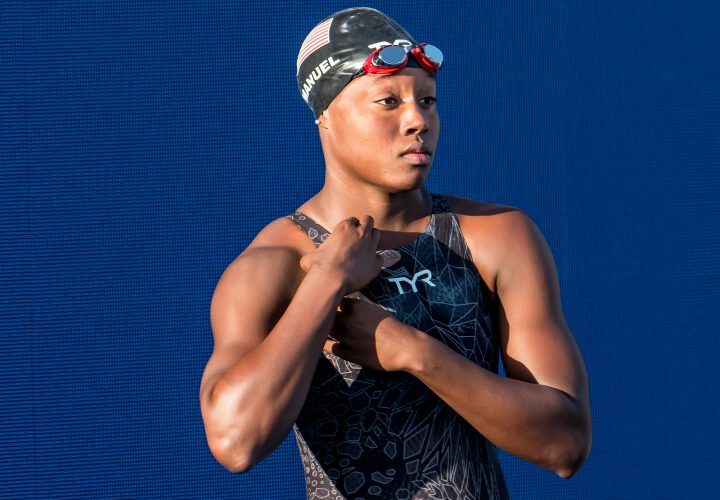 Madisyn Cox, Nathan Adrian and Simone Manuel also earned wins. No surprises to open the finals session as Katie Ledecky cruised to victory in the 400 free, winning in 4:00.35, nine seconds ahead of Hali Flickinger, who finished in 4:09.71. Both times easily qualified for the 2020 Olympic trials. 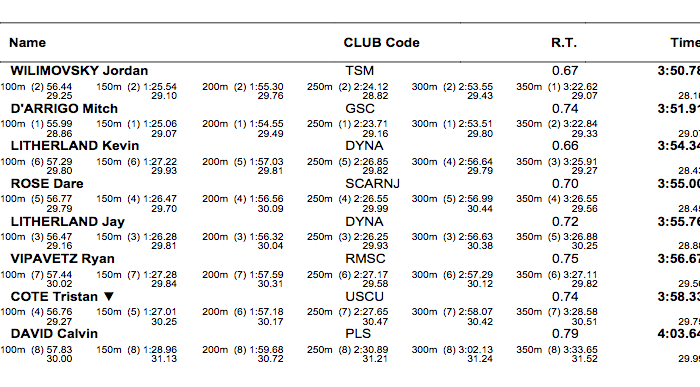 Kaersten Meitz and Ashley Twichell tied for third, both finishing in 4:11.52 to earn trials cuts. Erica Sullivan finished fifth in 4:12.19, followed by Emma Weyhant (4:14.34) and Chase Travis (4:14.42), each earning trials cuts. Paige McKenna finished eighth (4:17.64). Autumn Haebig, Julia Hassler and Chloe Freeman earned trials cuts from the B final. After Ledecky became the first double winner of the meet, Jordan Wilimovsky followed suit, winning the men’s 400 free in 3:50.78. 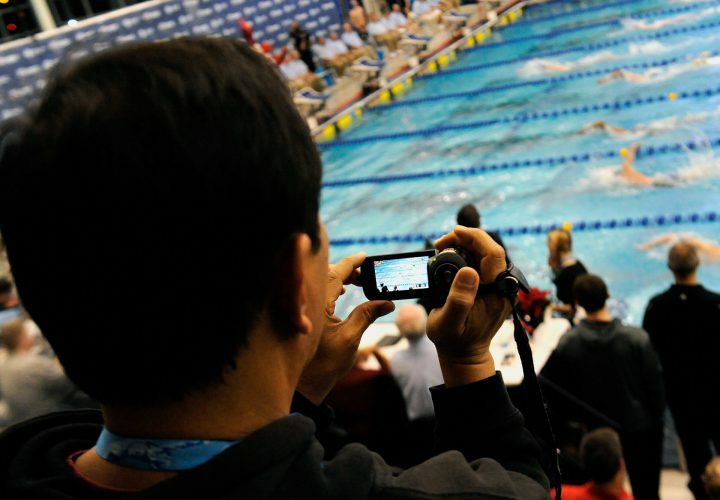 The time easily qualified him for the 2020 U.S. Olympic trials in his second event. 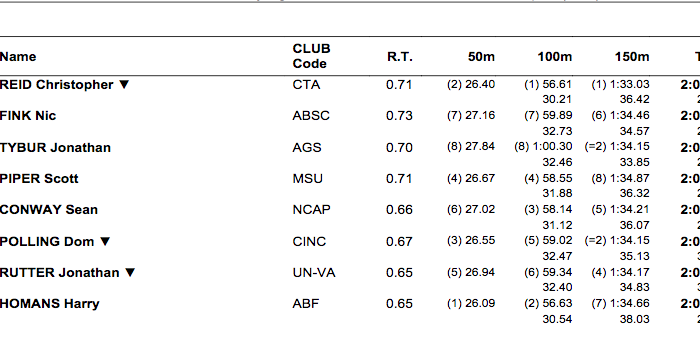 Mitch D’Arrigo finished second, finishing in 3:51.91, also qualifying for trials. Other trials qualifiers were Kevin Litherland (3:54.34), Dare Rose (3:55.00), Jay Litherland (3:55.76) and Ryan Vipavetz (3:56.67). Madisyn Cox continued her strong meet in the 200 IM. After taking the top seed in prelims, she bettered the field by winning the event with a finals time of 2:10.76, easily a trials cut. Kelsey Wog finished seconding 2:11.69, followed by Erika Seltenreich-Hodgson (2:14.24), Meg Bailey (2:15.53), Emily Escobedo (2:15.83) and Torri Huske (2:16.83). 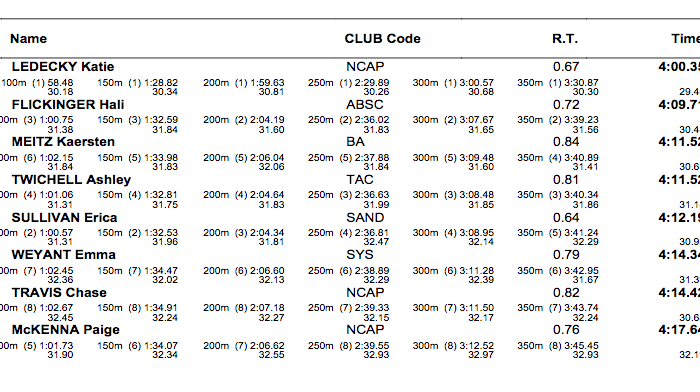 The top six earned Olympic trials cuts. Christopher Reid was second after the butterfly leg of the 200 IM, but took control of the race during the backstroke leg and never surrendered the lead, finishing in 2:02.18 to win the national title and qualify for the Olympic trials. Nic Fink made a late surge to make the race extremely interesting. 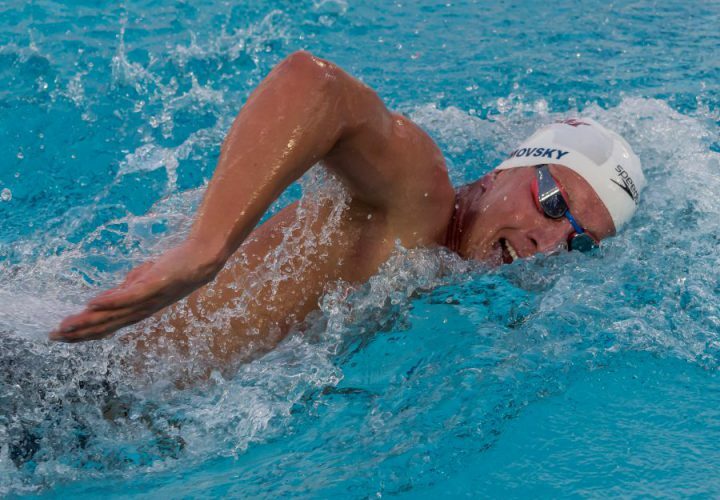 He was seventh after the butterfly and backstroke legs, moved up to sixth after the breaststroke but finished second in 2:02.97 thanks to his 28.51 freestyle leg. His time qualified for trials along with Jonathan Tybur (2:03.41), Scott Piper (2:03.69) and Sean Conway (2:03.82). 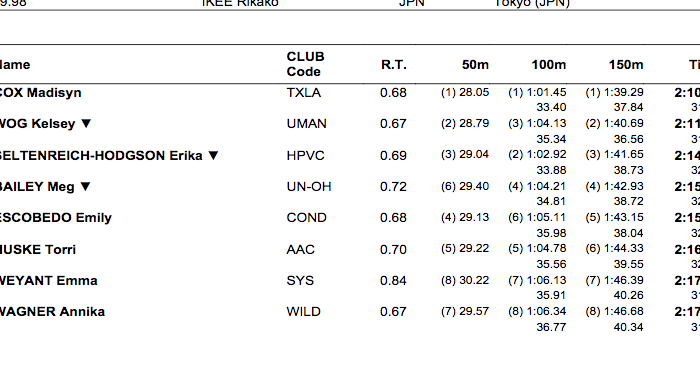 Simone Manuel came in with the top seed from prelims and that seed held up. Manuel won the 50 free in 24.39 to hold off Madison Kennedy (24.87) at winter nationals. Anna Hopkin finished third in 24.93, followed by Margo Geer (24.97), Grace Cooper (25.34), Amanda Kendall (25.37), Torri Huske (25.42) and Claire Curzan (25.53). 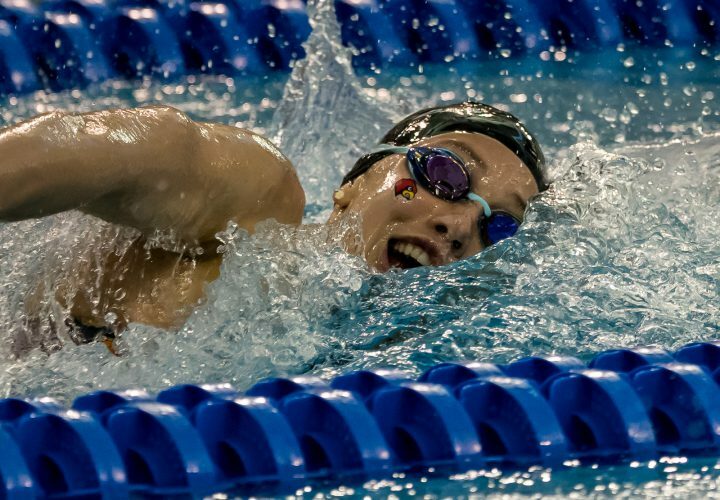 All of the finalists earned an Olympic trials cut, as did Linnea Mack (25.69), Kobie Melton (25.79), Evan Arsenault (25.89) and Gabby DeLoof (25.96) from the B final. Nathan Adrian surged to the men’s 50 free title. The Olympic gold medalist clocked a 21.94 to hold off a closing Michael Chadwick, who finished in 22.12. Both easily earned Olympic trials cuts. Payton Sorenson finished third (22.45), followed by Aaron Greenberg (22.71), Erik Risolvato (22.74), Cameron Kidd (23.11) and Payton Woods (23.13), each earning trials cuts.